Provide comfort for the family of John McDermott with a meaningful gesture of sympathy. John “Champ” J. McDermott, 86 passed away on April 15, 2019 at home. Born In Throop, PA to the late James and Katherine McDermott. 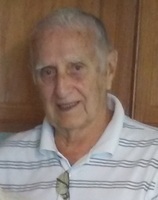 He was preceded in death by his wife, Mary McDermott in December, 2018. Champ served in the United States Army Battalion in Germany during the Korean War. Prior to his retirement, he was employed at Harper & Row. He was a member of Elmhurst Country Club since 1970. He loved the game of golf. Surviving are his children, Donna Mead and husband Rick, Ft. Myers, FL; Debra McDermott, Dickson City, PA; John McDermott, Jr. and wife, Donna, Chandler, AZ; and Nicholas McDermott and wife, Kelly, Throop, PA; 11 grandchildren and 13 great-grandchildren. In addition to his wife and parents, Champ was also preceded in death by a sister, Delores Piekanski. A private Mass will be held at St. Mary’s Chapel in St. John’s Cemetery, Throop at the convenience of the family. To send flowers in memory of John J. "Champ" McDermott, please visit our Heartfelt Sympathies Store. Provide comfort for the family of John J. "Champ" McDermott by sending flowers.